A part-time poker player from Minnesota’s Twin Cities suburb of Burnsville has been charged with felony counts of securities fraud and theft by swindle of over $35,000, the criminal proceeds from which, according to prosecutors, were used to fund at least a part-time tournament poker career. Semin Topalovic, 26, of Burnsville, was charged in Dakota County District Court on November 9 with the latest in a long-running series of securities violations. Topalovic, according to the Dakota County criminal complaint, conned an unnamed woman into depositing much of her savings and additional money secured from bank loans with Topalovic for investment into a company called Mannheim Associates LLC. The $155,000 invested by the victim in early August 2018 was purportedly for options trading, though the victim quickly became concerned over the lack of followup contact from Topalovic and sought help from authorities within weeks. Meanwhile, Topalovic and his sister, Armela Topalovic, had quickly drained the victim’s funds from the “Mannheim Associates” bank account for personal use. Based on later developments, Topalovic violated that agreement soon after the ink was dry, quickly creating the new Mannheim Associates business front and designing new YouTube videos to assist in the ongoing swindles of the current case’s victim and others. The ongoing investigation also uncovered more than $100,000 in unpaid civil settlements owed by Topalovic in connection with prior investment swindles. The victim provided agents with copies of the documentation she had received from TOPALOVIC, along with copies of her communications and YouTube links he had sent her. Agents watched the videos and saw TOPALOVIC introduced as a hedge fund manager. In the video he talks about investing, that he represents the GoldView Investment Group and solicits investors. He claims to have turned $6,000 into six figures within two years. However, agents were aware that none of these things were true. Agents determined that TOPALOVIC is not licensed by the SEC and does not appear to be employed. 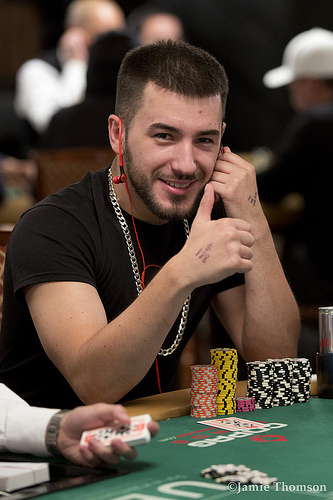 Agents found information in open source material that shows that TOPALOVIC travels around and competes in Texas Hold ’em Tournaments all over the U.S. Indeed, a search of Hendon Mob results shows Semin Topalovic with a dozen recorded cashes worth a total of $43,576. The cashes are all from the years 2015-18 — when Topalovic was known to be operating his alleged investment scams — and were scattered all over the map. Topalovic’s recorded cashes came at a couple of prominent Twin Cities card room, Florida, Ohio, Indiana, Las Vegas, and even at a PokerStars Caribbean Adventure in the Bahamas, despite little evidence of his actual poker prowess. 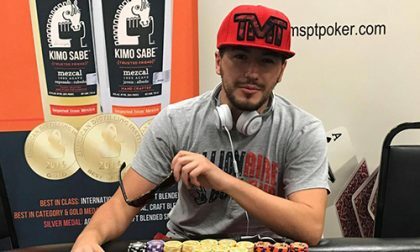 Topalovic, a native of Germany, is far from the first poker-star wannabe to fund his dreams through illicit means, though he had a second “career” as well. 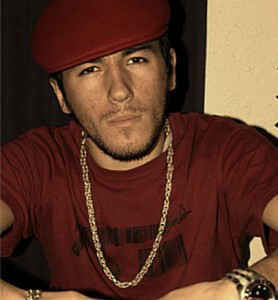 Topalovic also created a couple of social media accounts to boost his dreams of being a rap star and record producer, under the name “Billions” (him) and “East Bloc Records” (his purported company and label). As with the poker career, though, his rap dreams will likely wait for a while, as Semin Topalovic faces up to 25 years in prison and up to $110,000 in fines on the two felony counts. Agents obtained the bank records for Mannheim and on August 3, 2018 observed a transfer from the victim into the account of $118,047. Another transfer was made on August 9, 2018 in the amount of $25,000. The name on the bank account is that of S. TOPALOVIC’s sister – Armela Topalovic. A review of the account shows that between 8/1/18 and 8/31/18 approximately $73,500 in cash withdrawals was made, $28,000 in spending on transportation, hotels, dining, and consumer products, $14,500 in transfers to A. Topalovic’s personal bank account and $30,000 in wire and online transfers to other people. The ending balance for the account at the end of August was $1,219. Additional records were located for accounts for the TOPALOVICs from Bank of America; one showed S. TOPALOVIC withdrawing $169,000 in cash during March of 2016 and spending an additional $11,000 on expenses such as travel, hotels and casinos. Another Bank of America account for A. Topalovic shows her receiving over $160,000 in funds from two other people in December of 2017 and January of 2018. The majority of the funds are withdrawn in cash and the account was forced closed on August 21, 2018 for being overdrawn. A. Topalovic’s phone was seized and searched pursuant to the warrant. Agents noted extensive communications between her and S. TOPALOVIC. A. Topalovic frequently booked and paid for airfare, hotels, Uber rides, and food delivery for S. TOPALOVIC. There were also communications regarding S. TOPALOVIC giving money to A. Topalovic. Agents found a conversation between the two discussing the money from the victim and for A. Topalovic to set up the bank account. S. TOPALOVIC refers to the victim as an “investor”. Agents discovered that A. TOPALOVIC has three Mercedes-Benz C300 cars registered in her name in Minnesota, a 2014 and two 2015 models. A. Topalovic is also not registered as a financial advisor and does not have any SEC licenses. Him and one of his partners Christopher M Gasner took $100,000.00 from an investment team we had built. I fortunately only invested $5,000.00 into this. Christopher M Gasner ignores me constantly with zero communication. How can I get my $5,000.00 back legally? I have mountains of proof and evidence. That is a lie^. I’ve given all the facts and been 100 percent honest. I borrowed funds to purchase equity of TMT clothing company. It was a deal that sam and tezzarre champion were backing…and obviously was a fraudulent deal. I personally put about 50k into the deal. I came out with nothing besides a couple hats and the best and worst business trip of my life. I purchased equity of Sam’s hedgefund and invested heavily into the business. He owes me several hundred grand. He even stole my identity and cleaned out my accounts. Hes stolen millions of dollars from thousands of people.